How to play Hot Streak Solitaire? Hot Streak Solitaire is a single player game with chat. Earn points by making strings of cards one higher or one lower than your active card. Clear all the card pyramids to advance Poke through the scene! 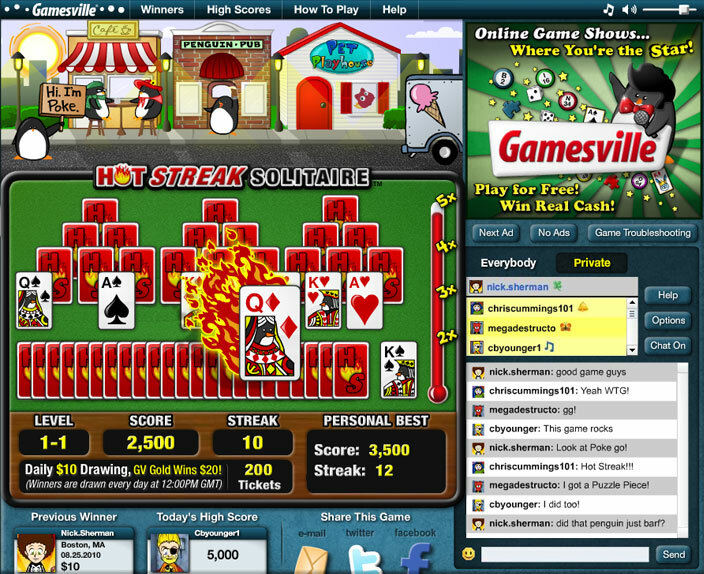 Hot Streak Solitaire is composed of multiple levels. Each level contains 12 rounds. Earn points by making strings of cards one higher or one lower than your active card. Aces are both high and low. Can't make a string higher or lower? Click the deck to get more cards. Every time you remove a card from the playing field, the Bonus Multiplier moves up one notch. Every time you draw a card from the draw pile, the Bonus Multiplier moves down one notch. If you can move up the bar so it lights up 2x, 3x, 4x, or 5x, then your final score for that level will be multiplied by that amount -- as long as it doesn't fall below that before the end of the round! The round ends when the deck is empty and there are no more matches, or when all the cards are cleared.